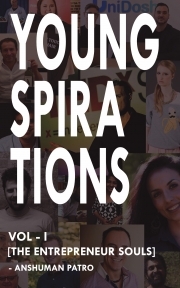 Description of "YOUNGSPIRATIONS: Volume I"
Youngspiration is the self-help book for people who desperately want to live their dreams but don’t know where to start. # Get inspired and get a life you will love. # Discover your true potential and get out of your shell. # Live life on your own terms. By the end of this book, you’ll understand how to take your first and most crucial step towards your life goal. Anshuman Patro is a “productivity and leadership consultant”, with over decades of experience in the startup world. He is well known for taking on significant accountabilities in building High-performance teams and consistently delivering business results. Currently, Anshuman is focused on helping organizations, technologists, managers and young entrepreneurs to achieve their goals, by unleashing their true potentials. Reviews of "YOUNGSPIRATIONS: Volume I"